As the 62nd International Car Show (IAA) recently opened its doors in Frankfurt a nine month preparation and a two month setup ended for the planners of the DaimlerChrysler AG booth. The company furnished Frankfurt's "Festhalle" (festival hall) with LED technology as well as more than 500 moving lights and scores of PARs. 10,000m and 68 cars were illuminated this way. Besides the Mercedes-Benz booth there were also the booths of Smart and Maybach located in the festival hall. 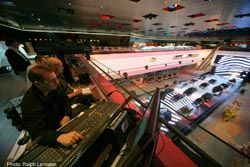 For lighting control the planners of TLD Planungsgruppe GmbH relied on an MA Lighting system consisting of five grandMA full-sizes, three grandMA lights, seven MA NSPs, 24 MA 2Port Nodes as well as 11 HP ProCurve Switch 2626. The installed fiber optic network had a length of 1.4 kilometers and connected seven equipment rooms. 35 DMX universes were used for the show. MA NSPs, located in one room, provided the necessary processing power and distributed their signal to the MA 2Port Nodes, which were located throughout the festival hall. The planners took a lot of steps to ensure maximum reliability. Amongst others a Spanning Tree Algorithm was used for the network. Furthermore the system structure was build up in a way that even the failure of multiple NSPs would not have affected the show. Also, the main console, controlled via Timecode and MIDI, was seamlessly backed up by another MA console. All these precautions were undertaken due to the fact, that a failure would have caused every light in the booth to go out. For the fair 120 tons of equipment were installed into the hall roof. Amongst others there were Vari*Lites VL3500 spot, VL3000 spot, VL5 arc and VL5 tungsten as well as scores of ETC CE Source Four PAR. Nearly 1,600 meters of truss and 6,000 meters of steel and aluminum pipes formed an extensive rig. The strictly structured trusses served as suspension for a half transparent metal ceiling. All spots were symmetrically placed in openings in that ceiling and by this nearly invisible. An absolute eye-catcher was the so named "car-walk", a 50 meters long and twelve meters wide street which consisted of Barco Mistrips. At the front end it ran into an Elementlabs Stealth curtain which had a Hibino Cromatec HD LED-wall installed above. Furthermore there was a stage implemented into the booth design for the world premiere of the concept car F700 which was interactively presented by a moderator.